Bloom actually sports both a standard and a Hybrid version of their mattress, so today we will look at the standard model and return to the Hybrid in the future. At first glance this seems a strange mattress; visually different to others which we would expect to have smooth sides. This one does not, it has an almost ridged outer texture that presumably reflects the reinforced structural integrity found on the inside. 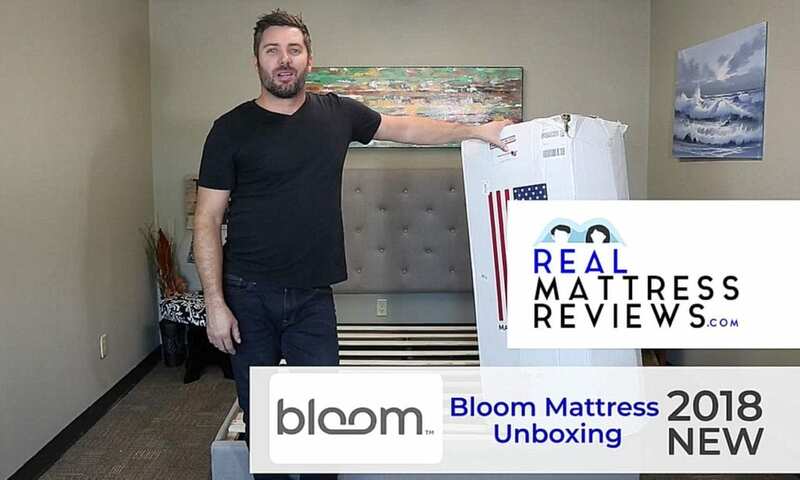 At any rate, we put the Bloom mattress to the test to find out how it compares to other brands… so read on to find out if this is the mattress you have been dreaming of! Bloom have some pretty immaculate branding, we must admit. By comparison to other brands, each of their beds has an embossed, stitched-in name to it that other companies might have only attached to the mattress with a label. We like this idea, since you will always know when you come across a bloom mattress. The brand is an offshoot of Brooklyn Bedding, a manufacturer well known for quality products. Their website is neat and tidy, their FAQ’s, help sections and contact details all clearly displayed and indicative of a brand that can be trusted to produce high quality wares… They have spent ample amounts on research and development of the products, have a catchy logo and use colors that reflect the richer things in life. When it comes to branding, the only thing we could say that was wrong with this brand is that we had not seen any advertising for them in the past. For branding, we gave Bloom a 9 out of 10. They could easily earn that extra point with a few more targeted ads. Our full review will be up soon and we will include all the details on what to expect form this mattress. In the meantime, make sure to check out our other popular Brooklyn Aurora and Brooklyn Signature reviews. As well as visit bloomMattress.com to see the bed for yourself. Delivery of the Bloom mattress is usually free as shipping is included in the price. The mattress will come to your door vacuum packed and sealed in a box for your ease. This method of transportation also helps to lower carbon emissions and keep the planet safe! Once your box has arrived (usually within 8-10 working days) we recommend that you take it to the room you are placing it in before you remove the packaging. This will make it easier to position once it has expanded. Next, take a sharp tool and carefully remove both the box and the plastic wrapping – being especially careful not to damage the fabric of the mattress as you do so. Afterwards stand back and watch your mattress expand. It should take no more than 24 hours to fully expand but you will be able to sleep on it before then. Ultimate comfort however, is unlikely to be achieved until the second night. We gave the Bloom mattress a 10 out of 10 for delivery and setup. It’s both free and easy, so there is no room for complaint. • Love a memory foam mattress but hate the associated sinkage. • Want to choose between three different firmness options but realize most brands only craft their wares in one rating. • You and your partner both agree to the same firmness rating. 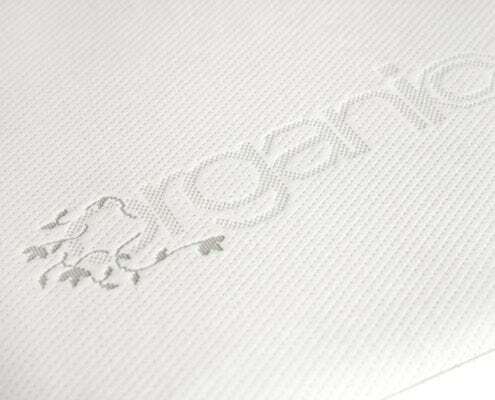 • Want to opt for a natural mattress whose materials come from sustainable sources. • Is completely safe for babies. • Want a 100% USA made bed. • You and your partner like different firmness ratings. • Want a hybrid mattress – opt for the hybrid Bloom instead. • Love to sink into a deep memory foam mattress, this one has all the goodness plus a little bit of bounce. This brand uses a natural Talalay latex in the top layers of the foam mattress which presents a light, sleeping-in-clouds feeling that keeps you from sinking into the bed like you would with most full-foam beds. The mattress also comes in three different firmness levels so that you can choose which you prefer. The medium firmness mattress sits around 5.8 on the firmness scale which ought to give you some idea of the softness. Bloom uses both organic cotton and Joma Wool in their upper layers and finishes. This provides a cotton-soft topping that allows you a little more spring that a regular foam mattress. Both fabrics are highly breathable in an effort to increase air flow under the sleeper and stop you sweating. The specially crimped wool that they have chosen also gives extra plushness to the mattress, allowing it to suspend you in a deep layer of comfort that does not ‘swallow’ you like some foam beds might. For comfort and feel we had no complaints whatsoever with the Bloom mattress. The three choices of firmness give you plenty of scope for satisfaction so we had to give the Bloom a 10 out of 10 for comfort and feel. Motion reduction in memory foam beds is world renowned for being absolutely fabulous: that being said the Bloom mattress tries to minimize this a little. There are two kinds of people that love memory foam: those that want to ink in and those that don’t. This mattress proudly and unashamedly caters to the latter by providing the wool and Talalay fibers in that top layer to absorb some of the sink. This leads to a few complications in the motion reduction department. You want to be sure that your partner doesn’t wake you up when moving around at night and this mattress lacks a little in this department on account of the slight bounce. That being said it is still a full memory foam bed, so it performs way better than any spring or hybrid mattress. When it comes to motion isolation we reckon that Bloom have nailed a compromise pretty head on. We gave them an 8 out of 10 simply because it does not seem to be one of the main focuses of this package. To us, off-gassing is a deceptive smell. Every product you buy – be it new shoes, a new car or a new sofa – will all smell like the factory they were made in for a few hours when you bring them home. Off-gassing is more like the lingering scent of wherever you purchased your bed from rather than any fumes given off by materials. 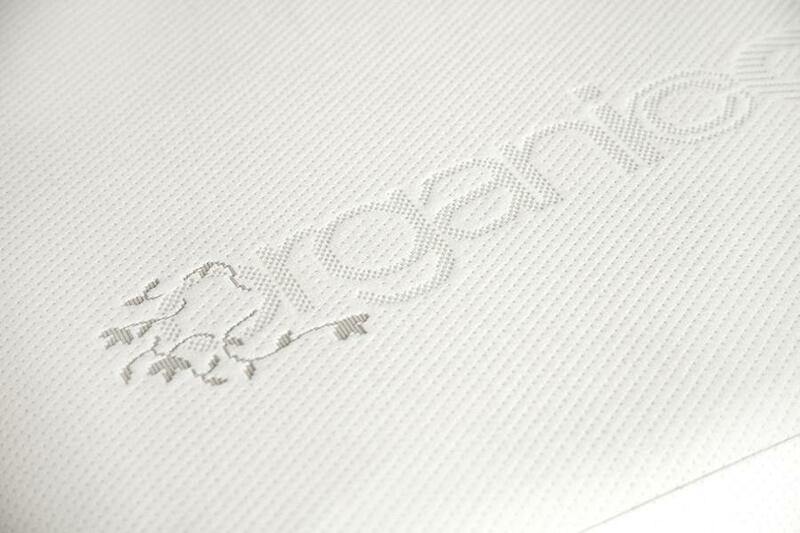 Strangely, organic or natural mattresses tend to have more of a smell because they use more natural materials. That being said; any smell that does come off your new mattress ought to dissipate within 36 hours at most. We found that the Bloom mattress barely smelled at all after 24 hours and once we had placed a mattress protector and sheets on it. It is similar to a new shoe or new car smell and does go away fairly quickly. 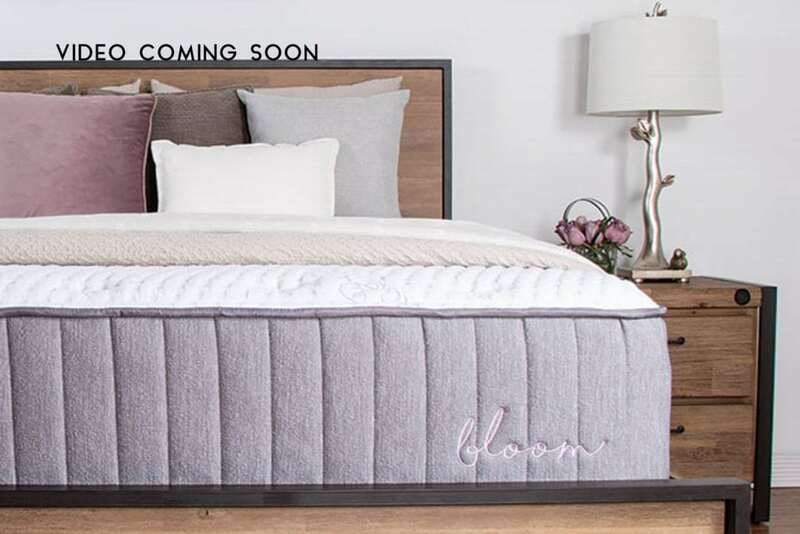 We gave the Bloom a 9 out of 10 for off-gassing simply because it is made from more natural materials than a regular full foam bed and therefore has a little more smell. The Bloom mattress goes a surprisingly long way to remedy this situation. That bouncy layer that prevented the sinkage mentioned under comfort and feel is the same technology which allows the edges of this bed to be firm, give a little bounce-back and stop you falling off the bed as you sleep! Likewise, the same technology throughout will stop you from rolling inwards if you sleep next to a heavier partner. In fact; despite being a full foam bed, the Bloom mattress scored more than 7 out of ten for edge support, making it a high score even for a standard mattress and a great score for foam. If you love a full foam bed but don’t want to slide off in the night then the Bloom is a great option for you. We gave the Bloom mattress a 10 out of 10 for edge support: it has the best edge support we have come across in a full foam bed yet. The fabric on the cover of this bed is made of cotton and wool, natural fibers that will wick away sweat and provide comfort. This provides a one inch Euro-top cover made from organically sourced and sustainable, patented Joma Wool. This creates for a plush layer which is supported and given added responsiveness by the under layer. Underneath that the second layer of foam comprises a 3 inch thick layer of their Talalay responsive latex foam that is deliberately placed to soak up sinkage from the bottom layers and act as a sort of bouncy top layer. This is the part of the mattress that stops you from sinking in and provides that cloud-like feeling we mentioned earlier. The next layer is formed from 6 inches of Talalay latex core foam. This stuff is much firmer than is used above and is made from natural rubber fibers that have proven in studies to give more airflow and breathability to the mattress than you might find in ordinary, unadulterated memory foam. This layer provides the overall base support of the mattress and needs to be firmer than the rest to hold it all up. This layered system prevents mattress flipping although you can turn it from top to bottom to preserve longevity. All in all we think Bloom have put a lot of time, dedication and thought into the make-up of their mattress. They hold patents on their wool and other materials, chose the alternative of Talalay rubber to regular memory foam and almost solved the firmness and edge support issues with their research. We gave the Bloom mattress a 10 out of 10 for materials. Not only are their research team doing an excellent job but the sustainability and the Eco-friendly aspects of the mattresses production are super-impressive in their own right. The Bloom all latex mattress is a 10″ of pure and safe natural materials that provide long term, durable support. As well as optimal comfort and resilient buoyancy to easily change sleeping positions on. The base of this bed uses 6″ of thick yet plush Talalay latex. Over this is another 3″ of Talalay lates that creates either a soft, medium or firm feel depending on which you choose. Over the very top is 1.25″ of breathable and moisture wicking Joma wool. As well as the soft and natural feel of organic cotton to top it off. 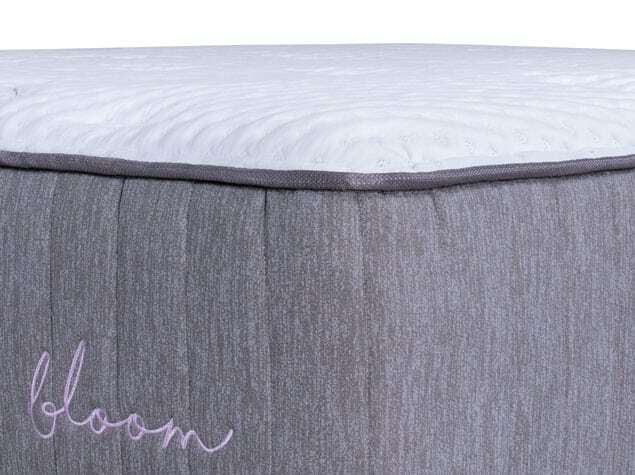 Bloom mattresses also features a cover that is both breathable and stylish. The Bloom will work great on any solid surface. The floor, platform slats, boxspring/foundation and they now offer an adjustable base as well. The Bloom mattress manages to have a reasonably cool temperature even though it does not have any specialized in-built technology that helps it to do so. What we mean by that is that other firms tend to use cooling layers of gel or grid-designed foam to allow air to pass underneath the sleeper; and the Bloom mattress is no exception. Because it is engineered in three separate layers and is divided into reinforced sections which all allows for maximum airflow through the mattress. It also has that specialized rubber foam and that wool that wicks away moisture vapor as you sleep while the cotton absorbs any excess. It might not have specialized cooling gel but the manufacturers have obviously put a lot of thought into what they have created here. We can tell that they considered temperature reduction even although they didn’t craft that extra layer. We had to give the Bloom mattress a 9 out of 10 for temperature. They did a great job for a memory foam mattress. The Bloom will work great on an adjustable base! No worries in this area. The only complaints we could find were related to other products by Bloom and were regarding price. However, you will get 20% off if you buy the Bloom mattress through Brooklyn Bedding. The Bloom mattress comes with a slightly better than your average 120 night risk free trial. During this time if you are not happy you can return it at no extra cost to yourself. They do ask that you keep the mattress for at least 30 nights from the date of delivery to give it a fair chance, but other than than the trial period marks a brand that is proud of a good product. When you buy from Bloom you will receive a 10 year no fuss warranty that allows you a free replacement should your mattress become faulty or suffer from defects. If indentations or impressions won’t remove themselves from the mattress and run deeper than one inch they will also replace it, which is quite a unique offer. They go so far as to extend their warranty to one year for their sheets – further building the reputation of a solid, trustworthy brand. Although other companies offer lifetime guarantees we don’t think the fact that Bloom don’t is anything to do with quality. We are pretty sure that this isn’t as big a brand as some of the others we have reviewed and feel that the warranty reflects their ability to cover costs, rather than any lack of confidence. For these reasons we gave the Bloom mattress a respectable 9 out of 10. They can have the full ten if they ever increase the warranty – but they were still too good to deserve an eight.